Salthouse Boatbuilders News: Blue Hulls and Jet Engines! Blue Hulls and Jet Engines! 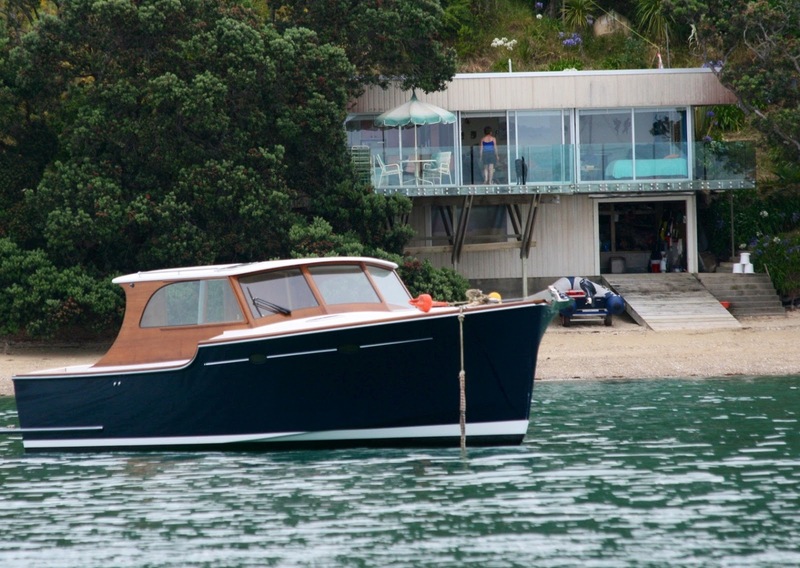 In December 2012, Salthouse Boatbuilders launched number five of the Southstar37 designs for the Frankham family of Auckland. The Frankham’s have a long standing connection with the marine industry in New Zealand and a wealth of boating knowledge. The Salthouse family themselves have over the years, worked on, sailed, built and repaired more boats than any of them can rightly recall. Bringing two families together with this rich and plentiful boating heritage has certainly brought out the best in this most recent Southstar37 – Lady May. When considering a new boat, the Frankham family had an unusual and demanding set of criteria. 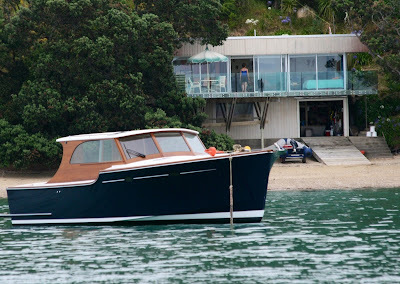 It was to be used primarily for commuting from Auckland to the family's Waiheke bach, set in a small tidal bay without any road access whatsoever. For 60 years, all traffic to and from the bay—including building materials, fridges and beds—had been transported by sea, a pleasant though difficult chore. Over the past 60 years a number of vessels had served this purpose. All were light, fast and seaworthy; some were pioneering—Excuse Me was built with the then new marine plywood by the shipwrights in AG Frankham’s engineering and ship yard in Daldy St in 1956. The 250 hp Chrysler Crown petrol engine and bullet proof gas tanks, used in landing craft in WWll, were purchased at a war assets auction. It could do 35 knots, making it the fastest vessel plying the Waitemata at the time. It was followed by Excuse Me II in 1962 with a Fordson 100hp diesel tractor engine because petrol had risen to 15c a litre. Diesel was 8c. Later came Moana Nui, a 36-foot vessel designed by Max Carter, built in 1974 which could top 35 knots. Summer Salt built in 1985 was a Pelin design which slipped easily into Auckland’s first dry berth marina. 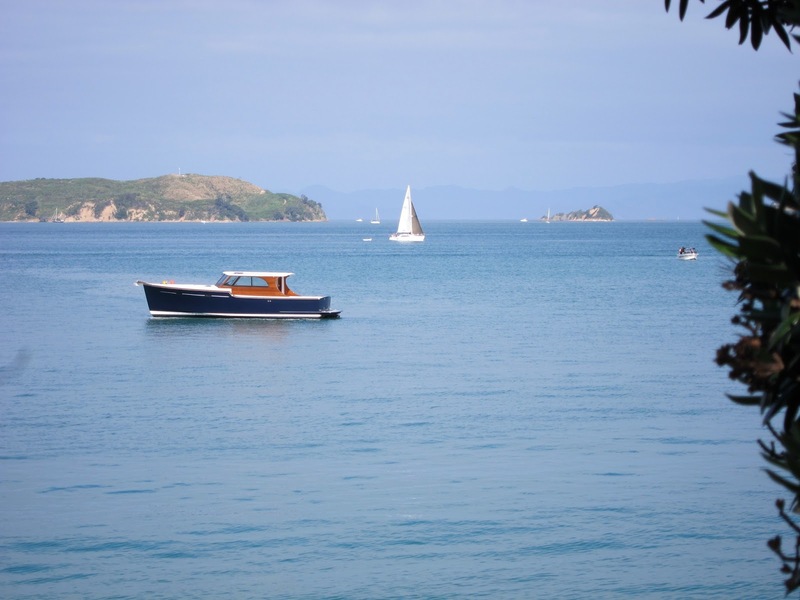 Again with over 35kts, this meant the batch at the bottom end of Waiheke was accessible within the hour. The Frankham’s needed a fast, beamy vessel to continue this tradition, but stern legs could not provide the required horsepower and came with a substantial maintenance cost. They settled on a jet unit which could take enough horsepower to get a 37-foot boat over 30 knots, and could operate in shallow water allowing access to the shore at any tide. Advantages of a jet multiplied; they are virtually maintenance free, are easy on the engine, and provide a degree of maneuverability unknown in direct drives or stern legs. They settled on a Southstar37 for a number of reasons. The traditional lines harked back to a stylish era of varnish and chrome, yet it was constructed of glass over a foam core, a phenomenally strong and durable construction that would last a lifetime—the design-life required on the vessel. The hull is efficient in form with a fine entrance to bust through harbour chop and a flatter section at the transom which allows Lady May to plane at relatively low speeds, carry a load, and importantly, operate in just 350mm of water. Finally, it was to be built to the exacting standards of Salthouse Boatbuilders who have created enduring designs to the highest standards for almost six decades. The resulting boat is a timeless design, and fit for purpose. She can plane at eight knots, lift her skirts to top 30 knots, operate in knee deep water and turn, literally, on a dime. In fact the Frankham’s no longer put the bow on the beach to unload—they come in astern until the transom touches, swing open the big stern doors and step off on to dry sand.